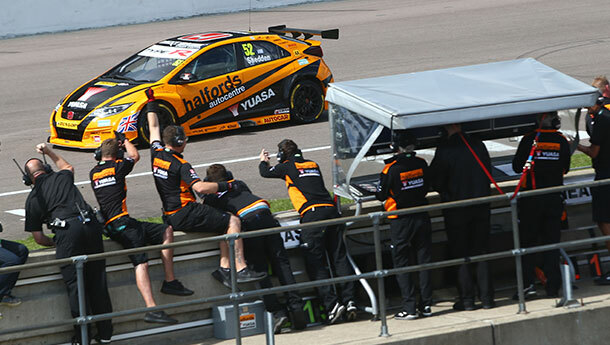 Halfords Yuasa Racing stole the initiative in the Dunlop MSA British Touring Car Championship at Rockingham this weekend (27/28 August) as Gordon Shedden and Matt Neal intensified their title push, with the former tallying his third victory of the season behind the wheel of his Honda Civic Type R.
Shedden mastered a sodden track surface in qualifying to annex his second pole position of the season, which he converted into a textbook lights-to-flag triumph in race one as he broke clear of his pursuers and established an advantage that he would never relinquish. Fastest lap ensured he snared every point on offer, while Neal recovered from an opening lap delay that dropped him outside of the top ten to ultimately regain his starting spot of eighth. On the less favourable hard-compound tyres in race two and with maximum success ballast aboard his Honda Civic Type R, Shedden found himself easy prey for his lighter rivals and had to produce a defensive masterclass to cling onto the final top ten position with a queue of cars crawling all over the back of him. Neal again fought back from a tough first lap as he pulled off several spectacular overtaking manoeuvres en route to sixth at the chequered flag. In race three, Shedden fairly scythed his way through the field from tenth on the grid, advancing to third by lap six and going on to hunt down leader Aron Smith in a contest that was punctuated by repeated safety car interventions. Despite applying the pressure, there was no way through and with Colin Turkington latching onto the back of the pair in the closing stages, the Scot sagely elected to settle for the runner-up spoils. On the hard tyres, Neal battled valiantly to concede as little ground as possible and fourth place at the flag was just reward for a stellar effort. That enabled the three-time BTCC champion to narrow the gap to the top of the Drivers' classification to just five points, with Shedden moving up to third, right in his team-mate's wheeltracks. Honda similarly cut the deficit to the summit of the Manufacturers' standings from 44 points to 31, as Halfords Yuasa Racing snared the lead in the Teams' table. "I'm dead chuffed with the weekend. I broke the slipstream to the guys behind in race one and then focussed on keeping everything nice and smooth. In race two, I was on a bit of a hiding to nothing on the hard tyres with maximum ballast, and I really had to get my elbows out at the end because I wasn't going very fast at all by then! It would have been nice to win race three, but Aron drove really well and didn't make any real mistakes and it would have required a fairly monumental lunge to try to get past. Then when Colin caught up during the final safety car period, I had to keep one eye in my mirrors too because he clearly had some good pace. Still, points make prizes as they say and we've closed back up to the top of the championship table. We will keep working hard and fighting to the very end." "Rockingham is always a tough challenge physically, and in truth, we weren't too sure what to expect coming here but we kept our heads down, plugged away and leave with a solid bagful of points. The first two races were pretty heavy going, but when I got some clear air, the Honda Civic Type R felt really strong. 'Flash' warned me that I would be up against it on the hard tyres in race three, so I was over-the-moon to finish fourth - I really didn't anticipate being able to hang on as well as that. To come away with both of us firmly in the thick of the title fight is a great outcome. The pressure is mounting in the championship now with just two weekends to go and Silverstone next time out could be a tricky one for us, but believe me, we'll be giving it everything we've got."